US, 1938, 105 minutes, Colour. Errol Flynn, Olivia de Havilland, Claude Rains, Basil Rathbone, Eugene Pallette, Alan Hale. Directed by Michael Curtiz and William Keighley. The Adventures of Robin Hood is a classical action film. Made at Warner Bros. in the late '30s, attractively photographed in	colour with a Korngold rousing score, it also featured many of Warners' contract player. Errol Flynn and Olivia de Havilland had appeared in several films and were to make more together: Captain Blood, The Charge of the Light Brigade. Errol Flynn is at his dashing best and suits the role of Robin Hood, already prominent in people's imagination at the time from the silent version with Douglas Fairbanks. (He has had many successors from Cornel Wilde to Richard Greene to an ageing Sean Connery in the aftermath, Robin and Marian.) Basil Rathbone is yet again the villain confronting Flynn, culminating in yet another swordfight, all expertly done. Claude Rains is very good indeed as a mincing kind of Prince John. Eugene Pallette is a jolly Friar Tuck. All in all, The Adventures of Robin Hood is Hollywood film-making at its best. 1. The quality of the entertainment in this film? Its classic status and reputation as one of the best of its kind? 2. The legends of Robin Hood and audience familiarity, the silent traditions of Douglas Fairbanks Jr., the contribution of Errol Flynn, subsequent film and television productions? The enjoyment of the Robin Hood legends ? why? Heroism, the tyranny of Prince John and Guy of Gisborne and the Sheriff, robbing the rich, helping the poor? 3. The contribution of the star ensemble of Warner Bros. of the late '30s? Their popularity at the time, skill at acting, immersing themselves in the period and its atmosphere? The Warner Bros.' values of production, sets, costumes, colour photography, the Korngold score? 4. The film's filling in the historical background with the various notes about Saxons and Normans, Richard the Lionheart and the Crusades, John and his hold over people? The information and the knowledge of the issues. How well did he emerge from the screenplay itself? 5. Audience expectations of Richard the Lionheart as good, John as bad? Claude Rains and his insinuating style and behaviour as John? The contrast with Richard on his return? Conventional presentation of good and evil? 6. The presentation of Guy of Gisborne as a tyrant? Basil Rathbone and his style? Manner, demeanour, way of speaking? His ingenuity about the taxes, wealth? His hold over the Sheriff? The place of the Sheriff as villain in this film? A weak man under Guy? 7. 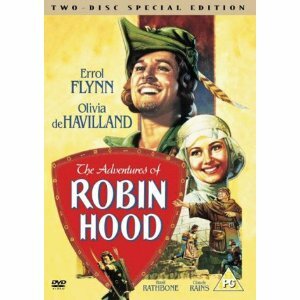 Errol Flynn’s style as Robin Hood? His rescuing of Much at the beginning indicating his heroism, the situation with the deer? The banquet in the forest, the raids? His archery and the competition and his escape? His loyalty to Richard and Richard's discovering this? The quality of the heroics, the genial personality? The initial encounter with maid Marian and the growth of love? The bond between Robin Hood and the various men in his band e.g. Little John, the fight with Tuck? 8. Olivia de Havilland's portrait of Maid Marian? The Norman background, her behaviour at the feast with Prince John and Robin Hood's attitudes? The banquet in the forest and her change of attitude? Learning more about him? Her help in his escape? The end and the appropriateness of her as the heroine for this kind of film? 9. The presentation of Robin Hood's merry men: the initial encounter with Little John, the fight with Friar Tuck, Will Scarlett, much and his relationship to Bess, Maid Marian's servant? 10. The portrait of the Norman villains, the knights and the nobles, the bishop and his misuse of ecclesiastical authority? 11. The portrait of the heroics in Sherwood Forest as explained by the suffering of the ordinary people? 12. The value and impact of the action sequences? The presentation of traditional and legendary heroism, good and evil, right and wrong, the predominance of right and the happy ending?